Update: This project was featured in the cover story in the Electrical Construction & Maintenance (EC&M) Trade Magazine - Click here to read. 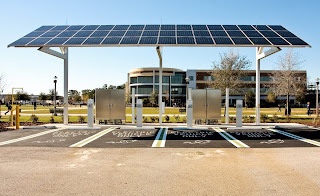 I recently finished a Case Study for Palmer Electric in Winter Park, Florida on the largest Solar Powered EV Charging Station in Central Florida...and it might the largest in the Florida. 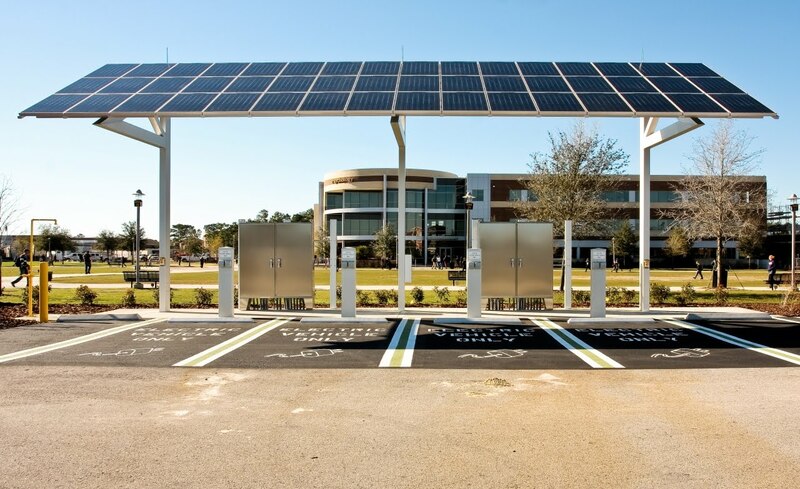 But this station is much more than it appears, as it's actually a "test mule" to allow the University to test new technology that will make the process of charging EVs from Solar more efficient. The University of Central Florida's College of Electrical Engineering and Computer Science (my alma mater) is working on new technology to increase the efficiency of power conversions...specifically DC-DC power conversions. The big idea is to make the conversion from photons (sunlight) to EV powering electrons much more efficient...like 2x more efficient. 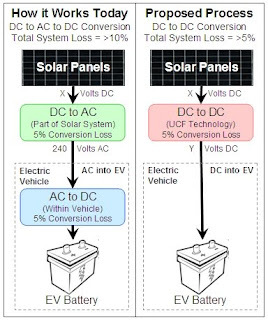 Today, the normal process is to convert the Direct Current (DC) from Solar Panels to Alternating Current (AC) using an inverter, which loses about 5% in the process. Then this AC is converted by your EV back to DC to charge the batteries...again losing about 5% in the process. Drs. 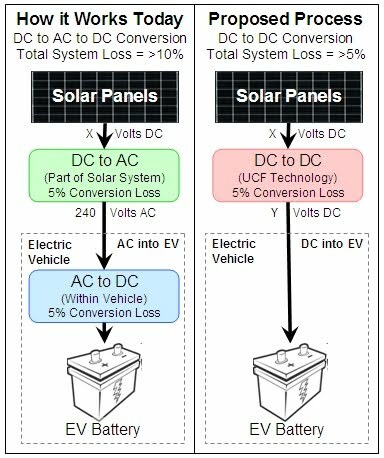 Issa Batarseh and John Shen believe they can reduce this 10% conversion loss to about 5% percent with their DC-DC conversion technology...and to facilitate Vehicle to Grid (V2G) power swaps in the future. This technology relies on using a DC charge port like the JARI connector that is installed on Battery Electric Vehicles (BEVs) like the Nissan Leaf and Mitsubishi iMEV. Once the SAE decides on a standardized receptacle for DC charging (like the J1772 for AC charging), we'll see more usage of DC charge ports on cars...since fast charging these vehicles will be increasingly important going forward. I didn't know that this is a test mule to allow the University to test new technology that will make the process of charging EVs from Solar more efficient. This is a brilliant idea for the free solar energy that the sun gives. I'd like permission to use the photo of the charging station for a display we're creating for the Montpelier Energy Fair. I'll assume it's okay unless I hear otherwise. Thanks! If this is a "test mule" or a prototype for much larger application, I think a patent will be needed. In all, I am happy that R&D here in Florida is thriving based on renewable energy. Someone must put to good use the heat of south breach. I think there are places in the US which uses this kind of technology. I mean, the idea is very beneficial to the people and to the overall flow of the economy, cause there'll be difference in its status.